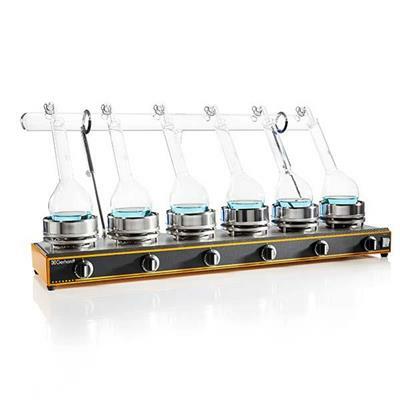 Gerhardt's Classic Digestion Apparatus has a serial heating unit with 6 individually adjustable heaters, offering a reliable and flexible solution for the manual Kjeldahl digestion process. Gerhardt’s traditional manual Kjeldahl apparatus offers a serial heating unit with 6 individually adjustable heaters that can be used with 50-, 100-, 250-, 500- or 750-ml Kjeldahl flasks. Flasks are available that also fit the VAPODEST. This apparatus can also be connected to a water jet pump or TURBOSOG suction system to process fumes.